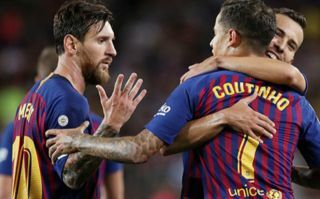 Barcelona take on Eibar on Sunday evening and the decision to select Philippe Coutinho in the starting line-up has gone down well with many supporters. The Catalan giants saw Atletico Madrid close the gap at the top of the La Liga table to just two points earlier on Sunday, and so they will be looking to respond with a win of their own. Further, after falling to defeat in midweek in the Copa del Rey, coach Ernesto Valverde will hope for a positive reaction from his players to bounce back and get back to winning form. In order to do that, he has gone back to as strong a starting line-up as possible, with Lionel Messi and Luis Suarez leading the charge. However, Coutinho also gets the nod alongside compatriot Arthur, although there is no place for Ousmane Dembele or Arturo Vidal in the XI. Nevertheless, particularly given that transfer speculation has been rife over Coutinho this week, with the Manchester Evening News even linking him with a shock move to Man Utd despite his previous spell with bitter rivals Liverpool, the fans below are delighted to see the Brazilian international start. In turn, he’ll hope to deliver a positive performance to silence the questions over his future at the Nou Camp, with Barca undoubtedly expecting him to have emerged as a leading figure in the side. Instead, he’s managed just six goals and four assists in 24 appearances so far this season, but he’ll be hoping to put in a stand-out display against Eibar to prove that he is a fundamental part of this team moving forward. Can’t wait for Messi to Create history ? So happy to see coutinho ???????????? Finally doing something right with starting Coutinho. Coutinho finally back in the starting XI yaaaaaaaaay ? ?